Summary: Did a complete ski ascent and ski descent of Mount Rainier via the Ingraham Direct route, the first time I've ever skinned all the way up from parking lot to summit on Rainier. Weather was near perfect, totally sunny above the cloud deck (6500-7500 ft) and almost calm. The entire route including the Ingraham Icefall is well filled-in with no crevasse navigation issues right now. Above the Icefall the route goes right (north) near 12500 ft, passing above the top of DC onto the edge of the Emmons Glacier (the left variation, joining the Gib Ledges route above Gibraltar Rock, appears to be very impractical this year due to large open bergschrunds). Snow conditions were very good for skinning with the recent new snow, allowing a relatively easy ski ascent all the way up Cathedral Gap, the Ingraham Icefall, and also the steep slopes above 12500 ft to the crater rim (14180 ft). Ski conditions on the descent were a mixed bag though, some nice, some OK, and some really horrible. Powder, windpack, nasty breakable crust, and even some corn. Nevertheless, it was a great trip in stellar early-spring weather conditions, with about 9100 vertical feet of ski ascent and descent. Seracs on the upper Ingraham Glacier near 12800 ft. Details: Following a spring snowstorm which brought 4" of new snow to Paradise on Monday May 10 (and much more to the upper mountain), the weather forecast improved quite a bit for late Tuesday into Wednesday. With winds forecast to be under 10 mph on the summit, it looked like a perfect time to try for a complete ski ascent and descent via the Ingraham Direct, a route which I'd ascended twice before in 2009, but not yet skied down. I sent out an email to partners who might be free midweek, but only two were game (Hannah and Eitan) and they both wanted to climb something more adventurous than I desired: Nisqually Ice Cliff or Nisqually Cleaver, then ski down the Ingraham. So the plan was to meet at Muir and stay at the public shelter together overnight, then climb our separate ways in the morning and rendezvous at the summit around noon, and ski the Ingraham together. Left Paradise in a gloomy overcast at 3:15pm, quickly becoming drenched by sweat in the 100% humidity as I skinned up. Approaching Glacier Vista, a few brief glimpses of the Mountain through the clouds gave hope for sunny skies above the cloud deck, then the fog and whiteout closed back in. Eventually broke out above the clouds around 5pm at 7500 ft just before Sugarloaf (point 7789), up into a glorious calm and sunny evening. A group of 4-5 French skiers was descending the Muir Snowfield, having a difficult time on the evening's breakable crust. 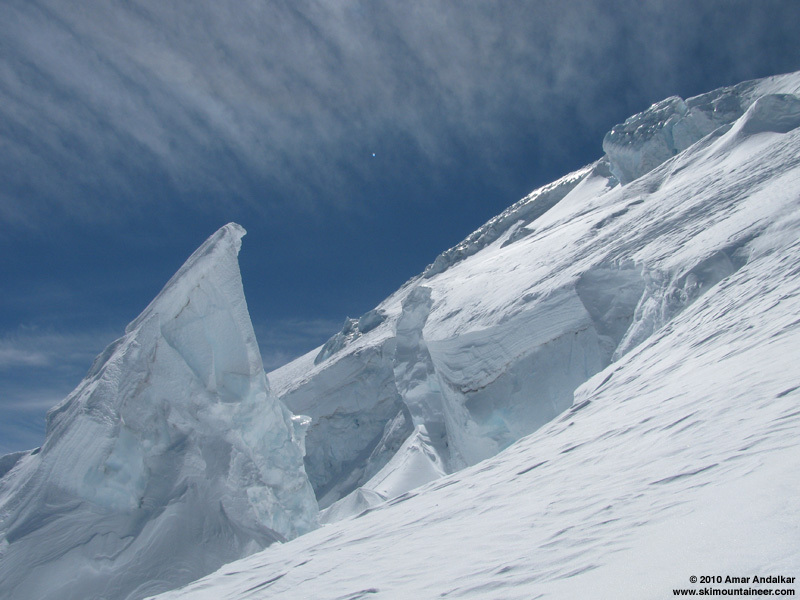 They had ascended the Ingraham Direct earlier that day and skied from the summit, reporting icy conditions up high on the summit dome, with 1-2 ft of powder lower down on the Ingraham Glacier. As I was planning to solo the ID, I was happy to know that a previous track was in place, somewhat easing the crevasse fall worries of a solo ascent following recent snowfall. Reached Muir just before 7pm, and chatted with Nick (whom I'd met several times this year at Muir and skied with once) and Matt at the RMI hut, they were also planning to ski the Ingraham the next morning, leaving at 6am. Eventually found my partners hanging out with Ted in the ranger hut, and joined them for dinner, then we hashed out plans for the next day. My partners would wake at 3am, while I would sleep in until 6am to avoid summiting before them as I ascended the much easier ID route. Winds had picked up as sunset neared, and we looked up at the summit dome to see a disappointingly large plume of snow being blown off the upper mountain, which did not bode well for ski conditions the next day. Soon 3am came all too quickly, they headed out at 4:15am, and I managed to get back to sleep before my own alarm went off at 6am. Sunny, calm, and absolutely beautiful weather above the cloud deck, which had fallen to about 6500 ft overnight, just revealing the tips of the highest peaks in the Tatoosh Range. A leisurely breakfast and morning photos had me skinning uphill by 7:30am, solo but wearing a harness and full glacier gear. Snow conditions were very good for skinning given the recent new snow, allowing a relatively easy ski ascent all the way up Cathedral Gap and through the Ingraham Icefall above 11400 ft, which is well filled-in and no trouble right now. Soloed up to 12500 ft, then caught up to and joined the rope team of Nick and Matt just before 10am. The only other party on the route was a group of three climbers on foot, postholing 1-2 feet deep in the new snow despite carrying snowshoes on their packs. They had left Muir at 2am and had taken nearly 8 hours to ascend 2500 vertical ft (!?!?) -- they would make it only a hundred feet higher before turning around. Broke trail from there to the summit, switchbacking through 1-2 ft of new snow up the steep slopes above 12500 ft. The high winds overnight had erased all traces of the French group's ascent track, so we had to do all the routefinding afresh. I was glad to have the security of the rope given the recent snow, which masked the telltale dips and sags of hidden crevasses. Above 13500 ft, the powder was gone and proper routefinding was essential to stay on skinnable snow while avoiding firm windblown areas and large patches of bare ice. The bergschrund crossing near 13700 ft was trivial, being well filled and solidly bridged. Just as we got near the crater rim (14180 ft), I suddenly spotted two sets of skis-on-packs, poking up over a small roll ahead. My other two partners were arriving via Nisqually Cleaver, perfect timing within a minute or so ahead of us. Summited Columbia Crest on skins as a group of five just after 1pm, in warm sunshine and a light northerly breeze around 10-15 mph. Took a bunch of summit photos and then skied down across the crater a few minutes later, enjoying some nice turns in 4-6" of powder atop a crust, then had lunch out of the wind near the SE crater rim, melting some snow on the Jetboil to replenish my water. We skied the Ingraham Direct together starting just after 2pm. The high winds overnight had hammered the new snow up high, producing a rough windpacked surface from the crater rim down to 12500 ft, which was OK skiing and not really too bad. However, as we dropped around the corner of a large group of seracs at 12500 ft and into the upper Ingraham cirque, the snow quality went to hell: a nasty breakable crust extended below that down to 11200 ft at Ingraham Flats. Truly heinous, the firm crust was as hard as chalk but breakable, with deep loose powder underneath, basically unskiable without kick turns, and perhaps the worst ski conditions I've ever encountered in over 400 days of backcountry skiing. It took over 45 minutes to cautiously descend those 1300 vert, trying to avoid serious knee injury. Much better below that, with sun-softened snow down from Cathedral Gap and a nice fast schuss around the Cowlitz Glacier cirque. We arrived back at Muir at 4pm to find a group of 8-9 foreign-sounding tourists lounging and boozing on the roof of the public shelter. They had gone through all our gear which we'd left in the hut, were still using our Thermarests on the roof, and had earlier used my sleeping bag and even my down booties -- I found a sweaty shirt in my nice ultralight down sleeping bag. They were not even apologetic in the least at first, saying they felt entitled to use anything they found in the hut, and eventually their shameless attitude made me just go ballistic on them -- I told them to get off the roof, give us our stuff back, and get lost. Definitely not what I needed after a very tiring day. Can't even figure out how they made it up to Muir, they looked like the sort of folks who would be unlikely to make it even a mile from the parking lot. Anyway, just a word of caution to those skiers and climbers who leave gear at the hut. We eventually packed up and skied down around 5pm, as high clouds moved in overhead and around the summit dome. The Muir Snowfield on the way out was OK, very crusty for a lot of the upper part, but eventually the snow improved below 9000 ft and there were even a few stretches of nice corn below 8000 ft. We dropped back into the cloud deck around 7000 ft, and from then on it was very sticky gloppy snow below the clouds from Pan Point out to Paradise. Although the mixed snow conditions (especially the horrible section) on the descent were a huge disappointment, I was still stoked to have enjoyed a glorious sunny day on the upper Mountain, and to have summited entirely on skis. SYNOPSIS...SKIES CLEARED OUT OVERNIGHT AS MOISTURE FROM AN UPPER LEVEL LOW OVER NEVADA MOVED SOUTH WESTERN WASHINGTON. WITH THE LOW LEVEL ONSHORE FLOW SOME LOWER CLOUDS WILL DEVELOP THIS MORNING. AN UPPER LEVEL RIDGE BUILDING OFFSHORE TODAY WILL MOVE OVER THE AREA TONIGHT AND REMAIN OVER WESTERN WASHINGTON THROUGH THURSDAY. DAYTIME HIGHS WILL WARM THROUGH THURSDAY WITH PLENTY OF SUNSHINE DURING THE DAY. A WEAK TROUGH OF LOW PRESSURE WILL MOVE THROUGH ON FRIDAY DROPPING DAYTIME TEMPERATURES A BIT. A WEAK SYSTEM COULD ARRIVE THIS WEEKEND. TUESDAY...MOSTLY CLOUDY. A CHANCE OF SHOWERS IN THE LATE MORNING AND AFTERNOON. SNOW LEVEL 6000 FEET. TUESDAY NIGHT...MOSTLY CLOUDY WITH A CHANCE OF SHOWERS IN THE EVENING...THEN PARTLY CLOUDY AFTER MIDNIGHT. SNOW LEVEL 7000 FEET. WEDNESDAY...MOSTLY SUNNY. FREEZING LEVEL 8000 FEET. WEDNESDAY NIGHT...PARTLY CLOUDY. FREEZING LEVEL 8500 FEET. THURSDAY...MOSTLY SUNNY. FREEZING LEVEL 8500 FEET. THURSDAY NIGHT...PARTLY CLOUDY. FREEZING LEVEL 9000 FEET. FRIDAY AND FRIDAY NIGHT...MOSTLY CLOUDY. A CHANCE OF SHOWERS. SNOW LEVEL 8000 FEET. SATURDAY...PARTLY SUNNY. FREEZING LEVEL 9500 FEET. SATURDAY NIGHT...MOSTLY CLOUDY WITH A CHANCE OF RAIN. SNOW LEVEL 8000 FEET. SUNDAY THROUGH MONDAY...MOSTLY CLOUDY WITH A CHANCE OF SHOWERS. SNOW LEVEL 7000 FEET. Summary: ... basically unskiable without kick turns, and perhaps the worst ski conditions I've ever encountered in over 400 days of backcountry skiing. Ouch! Sounds like we need some summerlike weather to take the edge off. Skin to the summit, ski to the car? NICE! Yeah Amar!! Congrats on your first skin to the summit. Did you celebrate by showing some skin on the summit? Yeah Amar!! Congrats on your first skin to the summit.� Did you celebrate by showing some skin on the summit? Just what you see in the summit photo, Dave, sorry to disappoint you. NOTE: I just replaced the original brief summary report with the full detailed version of the TR, about 4x longer with 7 more photos. Previous replies above were made based on the original version. Just as we got near the crater rim (14180 ft), I suddenly spotted two sets of skis-on-packs, poking up over a small roll ahead. My other two partners were arriving via Nisqually Cleaver, perfect timing within a minute or so ahead of us. I was wondering about the tracks that headed west from Muir to below the Nisqually icecliff that I saw Saturday. I didn't realize there was a route that went up the cleaver. Looks serac-filled and spicy!